HOUSTON (November 14, 2018)- A driver is on the run after causing a four car collision overnight on the North Freeway. 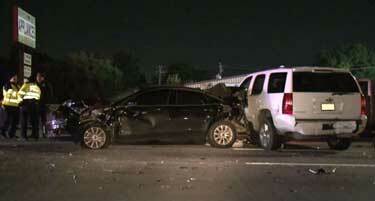 The accident occurred around midnight on Wednesday near I-45 and Parker. The Houston Police Department reports the at-fault driver was driving a pickup truck heading south lost control of his vehicle and slammed into the wall. A woman driving a white SUV slammed on her brakes trying to avoid the truck, but a city of Houston vehicle collided into the back of the SUV, followed by a fourth vehicle crashing into the city vehicle. HPD said the driver of the pickup truck fled the scene. There were no injuries, but the city employee was transported as a precautionary measure. If you or a loved one were involved in car accident, it is important to contact a legal expert to help you evaluate your options. Call (713) 987-7111 or send us an email to discuss your car accident injury case.